The ideal choice for the professional caterer, our Clingfilm Professional 450m x 300m roll offers an economical during high-traffic and busy sessions. Made from a PVC based low migration film, this large 300M long roll comes packaged in a durable cardboard box with perforated exit slots for easy distribution. With an excellent cling, this soft but strong cling film wraps easily around raw and cooked food for effective storage while also being suitable for use in microwave ovens. Manufactured under BRC approved quality systems and conforming to all UK and EU regulations for food use, this cling film can also be used to prevent cross contamination and the spread of food odors around your kitchen. Produced in the UK, this clingfilm offers exceptional performance for all catering environments. 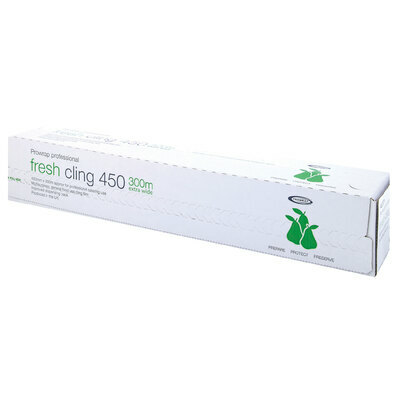 For less intensive kitchens, our Clingfilm Professional is also available in a 300mm x 300mm roll. Our Catering Supplies category has everything you'll need to keep your stocks high including Kitchen Foils and Baking Parchment.